Definition at line 27 of file MCWinCOFFStreamer.h. Definition at line 44 of file MCWinCOFFStreamer.cpp. Definition at line 124 of file MCWinCOFFStreamer.cpp. Definition at line 90 of file MCWinCOFFStreamer.cpp. Definition at line 234 of file MCWinCOFFStreamer.cpp. References llvm::MCFixup::create(), llvm::MCConstantExpr::create(), llvm::MCSymbolRefExpr::create(), llvm::MCBinaryExpr::createAdd(), Fixup, llvm::FK_Data_4, llvm::MCEncodedFragmentWithContents< ContentsSize >::getContents(), llvm::MCStreamer::getContext(), llvm::MCEncodedFragmentWithFixups< ContentsSize, FixupsSize >::getFixups(), llvm::MCObjectStreamer::getOrCreateDataFragment(), llvm::SmallVectorImpl< T >::resize(), llvm::SmallVectorBase::size(), llvm::MCObjectStreamer::visitUsedSymbol(), and llvm::MCSymbolRefExpr::VK_COFF_IMGREL32. Definition at line 169 of file MCWinCOFFStreamer.cpp. References llvm::MCSection::getAlignment(), llvm::MCObjectStreamer::getAssembler(), llvm::MCStreamer::getContext(), llvm::MCContext::getObjectFileInfo(), llvm::MCObjectFileInfo::getSXDataSection(), llvm::COFF::IMAGE_SYM_DTYPE_FUNCTION, llvm::MCSymbolCOFF::isSafeSEH(), llvm::MCAssembler::registerSection(), llvm::MCAssembler::registerSymbol(), llvm::COFF::SCT_COMPLEX_TYPE_SHIFT, llvm::MCSection::setAlignment(), llvm::MCSymbolCOFF::setIsSafeSEH(), llvm::MCSymbolCOFF::setType(), llvm::ARMBuildAttrs::Symbol, and llvm::Triple::x86. Definition at line 216 of file MCWinCOFFStreamer.cpp. References llvm::MCFixup::create(), llvm::MCConstantExpr::create(), llvm::MCSymbolRefExpr::create(), llvm::MCBinaryExpr::createAdd(), Fixup, llvm::FK_SecRel_4, llvm::MCEncodedFragmentWithContents< ContentsSize >::getContents(), llvm::MCStreamer::getContext(), llvm::MCEncodedFragmentWithFixups< ContentsSize, FixupsSize >::getFixups(), llvm::MCObjectStreamer::getOrCreateDataFragment(), llvm::SmallVectorImpl< T >::resize(), llvm::SmallVectorBase::size(), and llvm::MCObjectStreamer::visitUsedSymbol(). Definition at line 207 of file MCWinCOFFStreamer.cpp. References llvm::MCFixup::create(), llvm::MCSymbolRefExpr::create(), Fixup, llvm::FK_SecRel_2, llvm::MCEncodedFragmentWithContents< ContentsSize >::getContents(), llvm::MCStreamer::getContext(), llvm::MCEncodedFragmentWithFixups< ContentsSize, FixupsSize >::getFixups(), llvm::MCObjectStreamer::getOrCreateDataFragment(), llvm::SmallVectorImpl< T >::resize(), llvm::SmallVectorBase::size(), and llvm::MCObjectStreamer::visitUsedSymbol(). Definition at line 196 of file MCWinCOFFStreamer.cpp. References llvm::MCSection::getAlignment(), llvm::MCObjectStreamer::getAssembler(), llvm::MCStreamer::getCurrentSectionOnly(), llvm::MCAssembler::registerSection(), llvm::MCAssembler::registerSymbol(), and llvm::MCSection::setAlignment(). Definition at line 132 of file MCWinCOFFStreamer.cpp. References CurSymbol, llvm::MCObjectStreamer::getAssembler(), llvm::MCAssembler::registerSymbol(), llvm::COFF::SSC_Invalid, and StorageClass. Definition at line 148 of file MCWinCOFFStreamer.cpp. References CurSymbol, llvm::MCObjectStreamer::getAssembler(), and llvm::MCAssembler::registerSymbol(). Definition at line 253 of file MCWinCOFFStreamer.cpp. References llvm::MCObjectStreamer::EmitBytes(), llvm::MCObjectStreamer::getAssembler(), llvm::MCStreamer::getContext(), llvm::MCObjectFileInfo::getDrectveSection(), llvm::MCContext::getObjectFileInfo(), llvm::MCObjectFileInfo::getTargetTriple(), llvm::Log2_32_Ceil(), llvm::max(), llvm::MCStreamer::PopSection(), llvm::MCStreamer::PushSection(), llvm::MCAssembler::registerSymbol(), llvm::report_fatal_error(), llvm::MCStreamer::SwitchSection(), and llvm::ARMBuildAttrs::Symbol. Definition at line 311 of file MCWinCOFFStreamer.cpp. Definition at line 51 of file MCWinCOFFStreamer.cpp. References llvm::SmallVectorImpl< T >::append(), llvm::SmallVectorTemplateCommon< T, typename >::begin(), llvm::MCCodeEmitter::encodeInstruction(), llvm::SmallVectorTemplateCommon< T, typename >::end(), llvm::MCObjectStreamer::getAssembler(), llvm::MCEncodedFragmentWithContents< ContentsSize >::getContents(), llvm::MCAssembler::getEmitter(), llvm::MCEncodedFragmentWithFixups< ContentsSize, FixupsSize >::getFixups(), llvm::getOffset(), llvm::MCObjectStreamer::getOrCreateDataFragment(), llvm::MCEncodedFragment::setHasInstructions(), and llvm::SmallVectorBase::size(). Definition at line 85 of file MCWinCOFFStreamer.cpp. Definition at line 285 of file MCWinCOFFStreamer.cpp. References EmitLabel(), llvm::MCObjectStreamer::EmitValueToAlignment(), llvm::MCStreamer::EmitZeros(), llvm::MCObjectFileInfo::getBSSSection(), llvm::MCStreamer::getContext(), llvm::MCContext::getObjectFileInfo(), llvm::MCStreamer::PopSection(), llvm::MCStreamer::PushSection(), llvm::ARMBuildAttrs::Section, llvm::MCStreamer::SwitchSection(), and llvm::ARMBuildAttrs::Symbol. Definition at line 98 of file MCWinCOFFStreamer.cpp. References llvm::MCObjectStreamer::getAssembler(), llvm_unreachable, llvm::MCSA_AltEntry, llvm::MCSA_Global, llvm::MCSA_Weak, llvm::MCSA_WeakReference, llvm::MCAssembler::registerSymbol(), and llvm::ARMBuildAttrs::Symbol. Definition at line 120 of file MCWinCOFFStreamer.cpp. Definition at line 305 of file MCWinCOFFStreamer.cpp. Definition at line 94 of file MCWinCOFFStreamer.cpp. Definition at line 315 of file MCWinCOFFStreamer.cpp. Definition at line 299 of file MCWinCOFFStreamer.cpp. Definition at line 163 of file MCWinCOFFStreamer.cpp. Definition at line 319 of file MCWinCOFFStreamer.cpp. References llvm::MCObjectStreamer::FinishImpl(), llvm::MCStreamer::getContext(), and llvm::MCContext::reportError(). Definition at line 69 of file MCWinCOFFStreamer.cpp. 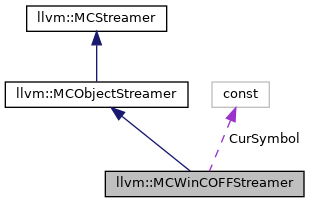 References llvm::MCObjectStreamer::EmitCodeAlignment(), llvm::MCStreamer::getContext(), and llvm::MCStreamer::SwitchSection(). Definition at line 34 of file MCWinCOFFStreamer.h. References BeginCOFFSymbolDef(), llvm::LCOMM::ByteAlignment, CurSymbol, EmitAssemblerFlag(), EmitCOFFImgRel32(), EmitCOFFSafeSEH(), EmitCOFFSecRel32(), EmitCOFFSectionIndex(), EmitCOFFSymbolIndex(), EmitCOFFSymbolStorageClass(), EmitCOFFSymbolType(), EmitCommonSymbol(), EmitIdent(), EmitLabel(), EmitLocalCommonSymbol(), EmitSymbolAttribute(), EmitSymbolDesc(), EmitTBSSSymbol(), EmitThumbFunc(), EmitWinEHHandlerData(), EmitZerofill(), EndCOFFSymbolDef(), FinishImpl(), InitSections(), llvm::MCObjectStreamer::reset(), llvm::ARMBuildAttrs::Section, Size, StorageClass, and llvm::ARMBuildAttrs::Symbol. Definition at line 72 of file MCWinCOFFStreamer.h. Referenced by BeginCOFFSymbolDef(), EmitCOFFSymbolStorageClass(), EmitCOFFSymbolType(), EndCOFFSymbolDef(), and reset().